Get out your hardhats and earplugs if you got ’em, the houses that stand in the way of construction at the Twenty One Clairtrell [map] condo project are about to be demolished. Luckily, the Rockport Group, the developer behind the project, is not allowing the potentially useful materials in the houses go to waste. Before Rockport signals the crew to move in with their wrecking balls on August 20, volunteers from Habitat for Humanity are combing through the old homes to take out doors, window frames, bath tubs and whatever else they think will come in handy for one of their many humanitarian undertakings. It’s great to see that much of the useful material is being salvaged and not simply carted off to the dump. Kudos to the Rockport Group for letting Habitat for Humanity have a go at the homes before demolition. that will be used in a future project. 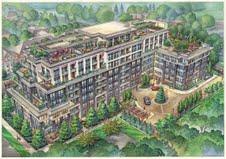 Rockport estimates that the condominiums will be completed in summer 2012. Once completed, Twenty One Clairtrell will offer a prime piece of real estate in one of Toronto’s fastest growing regions, North York. Only a short walk away from Bayview Station, on the quiet and reliable Sheppard Line, it will be easy to reach the downtown core from your doorstep. But with the uber-classy Bayview Village Shopping Centre one block away, who needs to go downtown anyway? A combination of trendy boutiques and iconic staples, the Centre boasts an impressive 110 retailers in the 440,000 square foot property. Congratulations to the Rockport Group for really getting the ball rolling on this project. We’re looking forward to following it closely. For more information call the sales centre 416-229-2110 or email info@twentyonecondos.com. The presentation centre is open Monday to Wednesday between 12pm and 6pm and on Saturday and Sunday between 12pm and 5pm.